I saw my first photograph of a ceropegia when I was about ten years old. It was Ceropegia racemosa subspecies setifera, and I was struck by the unusual flower and its graphic coloring. This was a plant I wanted to grow. However, it wasn't until about 30 years later, in the late 1980s, that I was able to find and begin to grow these vines with their weirdly sculptural and colorful flowers. Ceropegias are plants of tropical and subtropical regions from the Canary Islands (where Ceropegia fusca is native) through Africa and Madagascar to China, Indonesia, and northern Australia. They are found in a wide range of habitats from equatorial forest to semidesert. The wide climatic and geographical range gives rise to a variety of plant shapes and habits. Most ceropegias are vines—including all that are discussed in this article—but there are some that resemble small bushes, stands of gray organ pipes (Ceropegia fusca), slithering snakes (C. stapeliiformis), and legless lizards (C. armandii). The stems can be as thick as cigars (C. stapeliiformis) or as thin as twine (C. ampliata, C. leroyi). The leaves usually appear in pairs opposite each other, at nodes along the stems. The leaves can be minuscule (C. stapeliiformis), very succulent (C. sandersonii), paper thin and deciduous (C. elegans), large and broad (C. cumingiana), needlelike (C. dichotoma), or absent (C. devecchii). The roots of some ceropegias are fleshy; others are fibrous; and some are tuberous, the result of the different species evolving in areas with seasonal drought and terrains of varying soil qualities. Ceropegias as a group are unusual houseplants. Except for the common Ceropegia woodii and its cousin tuberous types, the vines are too vigorous for casual indoor growing. Provided they get good light, warmth, and moving air, many will quickly fill a four-foot tomato-cage support and reach for more. Flowers appear at the nodes, where both leaves and roots also form. They usually consist of a tube with hairs inside that point downward. The tube may be straight or have bends (Ceropegia aristolochioides) or bulges (C. crassifolia, C. rupicola). Its five corolla lobes (or petals) may be open (C. stapeliiformis) or joined at the tips (C. ampliata). The flowers are usually whitish, with combinations of bright green, brown, and maroon spots, stripes, and shading. The buds start out looking like small bullets, and as they grow they can develop bulges or curves, tops becoming umbrellas (C. sandersonii, C. monteiroae) or cages (C. ampliata, C. armandii). The bud of C. devecchii looks like a Buddhist vajra symbol before opening. Ceropegia distincta subspecies haygarthii resembles a spotted Venetian wineglass stuffed with little pillows and topped with a fuzzy antenna. The flowers can grow from almost nothing to 3.5 inches long in little more than a week. Blooming is triggered by a combination of increasing day length and warmer nights. In late spring, when nighttime temperatures are rising and the daylight hours are lengthening, ceropegias such as C. conrathii respond with faster growth and start blooming. Others, such as C. sandersonii, wait until the heat of midsummer, and still others, such as C. ampliata, don't flower until the days begin to shorten noticeably in fall. Soil quality does not seem to be very important for growing ceropegias successfully, but good drainage is vital. Regular applications of 20-20-20 fertilizer at half strength are beneficial during growth periods. The real key to a collection of gorgeously flowering ceropegias seems to be adequate warmth. They all benefit greatly from a warm summer spent outside in bright filtered light but out of direct sun. Most ceropegias are happy when temperatures are in the high 70s at all times, but they will tolerate cooler temperatures in winter while they are dormant. A sunny windowsill is all that some will require then. Ceropegias have relatively few pest problems. Tuberous types and some of the deciduous vines can harbor the occasional mealy bug. In the greenhouse or during the summer outside, a slug may find a tuber tasty. Plants are most vulnerable right after they move back inside after a summer spent outdoors. A ceropegia that has bloomed with an extraordinary number of flowers is especially susceptible to sudden death. The plant may have exhausted itself or its soil and be too weak to cope with the change in light and humidity that are part of moving inside. Other ceropegias may die suddenly from a fungal infection or rot. Once a thick stem has black spots on it, there is little you can do beyond cutting the growing tips off the plant and trying to root them and discarding the rest. The best way to a sustainable collection of abundantly flowering ceropegias is to take cuttings every year and discard the original plant after it's been in the same pot and soil for two years. (If you can't bear to discard the plant, at least repot it every two years.) Starting from scratch every two years is especially effective for vining types, which turn woody after a few years. Woody stems seem to lose vigor, but new stems sprout roots easily, and with new soil they will bloom more readily. Take cuttings any time the plant is growing. Allow the cut tip of a vine cutting to callus over for two to three days to prevent rotting. In spring or fall, put the cutting into either a clear plastic box or bag with a moistened mixture of half perlite and half peat moss until it develops roots. In summer, try curling the vines around in a pot or hanging basket on top of potting soil. In either case, keep the cuttings out of direct sunlight to prevent cooking them. If you successfully root cuttings, you'll have a number of plants that you can try growing in different areas of your home or garden. It's a useful way to find out where the plants thrive. Another advantage of multiples is that they serve as a form of insurance against losing the species from your collection. If you don't have luck or space for cuttings yourself, pass them on to friends who do. That way there's a chance that you can get a new start should you lose a rare plant. Over the years I have grown many species from all parts of the Ceropegia world, except India and China, whose export policies make it extremely difficult to obtain living plant material or seeds. The following plants are among the easiest to grow and bring to flower. None of the vining plants are small. I grow vining types (C. sandersonii, C. lugardae, C. distincta) in seven- to ten-inch clay pots with a trellis made from an slightly modified tomato cage that forms a wire column on which the plants can easily climb. The tuberous types (C. ampliata, C. leroyi) are grown in hanging baskets of varying diameters. 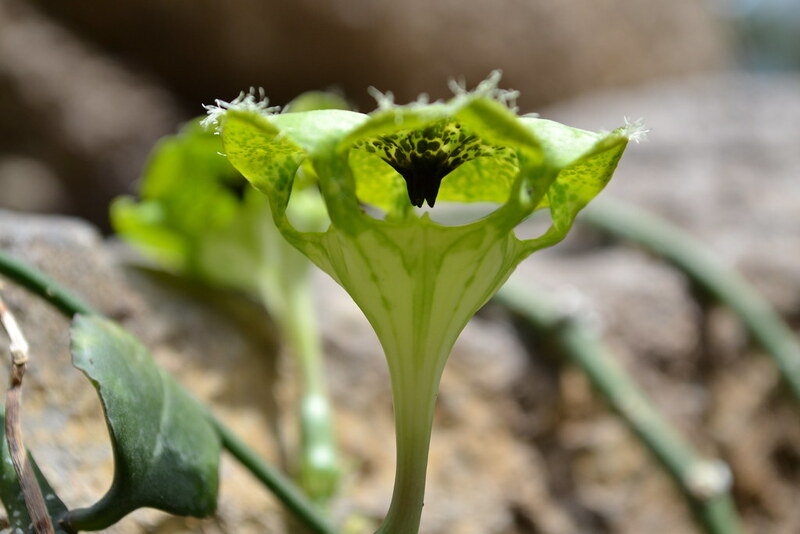 You can find more information about the plants discussed in this article and other Ceropegia species at http://sagereynolds.com. Ceropegia ampliata. Photo by Sage Reynolds. Native to South Africa, where it is found in Gauteng, Kwazulu-Natal, and the Cape provinces, this plant has fibrous roots and minuscule to invisible leaves. Unbelievable numbers of white and green flowers up to two inches long appear for about two weeks in September, completely covering the plant. Ceropegia ampliata is fairly easy to grow in ordinary well-draining potting soil. The plant trails and weakly attempts to climb before it begins to bloom and is best grown in a hanging basket. In summer, I hang the plant on the north side of my porch in bright light but away from direct sunlight and water it generously, like all my other plants in hanging baskets. This native of Tanzania is easy to keep and seems quite tame compared with some other varieties like Ceropegia aristolochioides and C. elegans, whose tendrils have to be controlled daily. Easily grown from cuttings, the plant has flower buds near almost every leaf in September. It thrives when grown outside for the summer, and the occasional cool night does not cause the demise of flower buds or other harm. During the early part of the summer, my plant was so small for so long that I set its pot and trellis into a pot where C. ballyana was growing (and not blooming). Now, several months later, they have entwined themselves so thoroughly, it will be difficult to separate the two. But it's easy to tell which vine is which: The leaves of C. denticulata are succulent and yellow-green with pointed ends; the leaves of C. ballyana are more succulent, slightly larger, and dark green with prominent central veins and round ends. Native to Angola and South Africa's Kwazulu-Natal and Cape provinces, it is one of the easiest ceropegias to grow. Only Ceropegia woodii, the common rosary vine, is easier. C. distincta subspecies haygarthii tolerates a wide range of conditions and will grow well in most home environments, though it may not bloom until it can be moved outside for the summer. This species is also less susceptible to rot if overwatered. The stems are a little more than 1/8-inch thick, the roots are fibrous, and the leaves are thin and deciduous. This vigorous plant will root where it touches the ground and easily fills a three-foot trellis. It's best to start new plants at least every two years if not every year, as the stems turn white after a year and seem less capable of supporting new growth. Flowers appear on new growth, and providing the growing area is warm enough, they will appear in profusion for a long period during the summer. With their fuzzy antennae, shaded corollas, and crisp maroon spots, they are delightfully comical. Temperature seems to be key, and I suspect that the species can be kept in continuous bloom in warmer climates, provided that the plants are repotted annually and fertilized heavily. I've had buds appear on my plants in early April as the days begin to lengthen noticeably, but all buds were aborted until nighttime temperatures stayed above 60°F. This plant, another native of South Africa, is closely related to C. sandersonii and very similar in flower color and shape. It is fairly new in the marketplace, remarkably easy to grow, and a prolific bloomer. The bright chartreuse flowers are about three inches long and have a lively purple fringe on the lobes that moves in the slightest breeze. Native to Mozambique and South Africa's Gauteng and Kwazulu-Natal provinces, this plant has very succulent, lance-shaped leaves, robust stems, and fleshy roots. It is fairly easy to grow and does best when it spends the summer outdoors in the same high shade that rhododendrons enjoy. Each spring, the plant sends up new growth from its roots. New stems give rise to a display of spectacular four-inch-long flowers. The vine may grow up to 12 feet long in the course of a summer outside. At the end of summer or sometime in fall, before you move the plant back into the house, cut it back drastically. Before winter I move the plant inside under the lights in my studio, cut it back, and water sparingly to prevent desiccation. The plant continues to grow more slowly through the winter. Ceropegia stapeliiformis. Photo by Sage Reynolds. Native to the Cape provinces of South Africa, Ceropegia stapeliiformis was one of the first ceropegias I collected and is one of the easiest to grow. In nature, the plant's stems grow horizontally along the ground toward a spot that offers dappled sunlight. C. stapeliiformis thrives underneath shrubs, where greater moisture promotes root growth and leaf mold provides nutrients. Shrub branches also offer supports on which the plant can climb and display its flowers higher up, where they may be more easily found by pollinators. For the collector, the plant's main attraction is its thick maroon- and gray-mottled snakelike stem, but its flowers are also surprisingly bizarre. When a new plant gets ready to bloom, its stem thins and starts to climb. Once the stem is about two feet above the roots, buds start to form, giving rise to numerous 2.5-inch-long flowers. Their corollas open to expose a fuzzy white or pale green star. The plant seems to like a place in high shade where it gets some morning and afternoon sun. When I have grown it in full sun, the stem has always grown away from the light, snaking around pots to climb an Abutilon or Pelargonium before blooming. It has never set seeds, even though I have seen a lot of small flies on the corolla lobes while the flowers were open. To bring the plant into bloom in cultivation, it's best to take new cuttings each year. Simply break off new shoots that may already have formed roots and grow them in new soil. Sage Reynolds is an artist and designer. He runs the Four Hands Design Studio, which he founded in 1977 with his partner, Colman Rutkin, in New York. He has been growing ceropegias and other succulent plants for more than 30 years. As a hobbyist, he has also hybridized azaleas, lilies, lithops, and abutilons. Thanks a lot, very informative article. I bought a rooted Ceropegia rhynchantha. Do you have some advice about the care? Thank you. Umbrella flower (Ceropegia sandersonii) blooms in the Desert Pavilion. Photo by Dave Allen.